Add flair to any kitchen or create your own place to relax with friends with the T-402-VPD Bar Table. Featuring a chrome gas lift and base to create a variable of bar height settings for your space. Add a contemporary touch to any kitchen by mixing or matching with any CorLiving barstools to get your own unique style. A great addition to any home! Versatility meets form with this extendable dining table. The innovative hidden butterfly leaf allows you to create extra serving space in seconds. They can be seamlessly tucked under the table top when not in use, negating the hassle of storing them around your home. The rich wood grain is accented by the cream base and tapered legs, giving it a versatile look that will work in any home. This high-top Remington 3 Piece Pub Table Set was designed for both durability and comfort. Featuring a scratch-resistant black melamine table top supported by a decorative chrome-plated steel frame. The two barstools are 30-in tall and are padded with top-grade leatherette covered seat cushions. Some assembly required. 180-Day Limited Warranty. This Stunning Table has a French inspired design and style. The table features a spacious tabletop that easily seats four. Decorative turned legs add interest to the piece. Finished in a dark natural brown, the piece will complement a range of dicor schemes. Finally achieve the modern look you'd always wanted with the Charles Dining Table, that promises an intimate dinner for two or four, gathered around this elegantly understated piece. Beautiful oak legs play on the Mid-Century style and seamless lines add versatility and keep this table transitional, easy to blend with any space or existing decor. Add an intricate vase and artisan dishes for a perfect pairing. T-402-VPD Adjustable Bar Table in Black Leatherette Add flair to any kitchen or create your own place to relax with friends with the T-402-VPD Bar Table. Featuring a chrome gas lift and base to create a variable of bar height settings for your space. Add a contemporary touch to any kitchen by mixing or matching with any CorLiving barstools to get your own unique style. A great addition to any home! 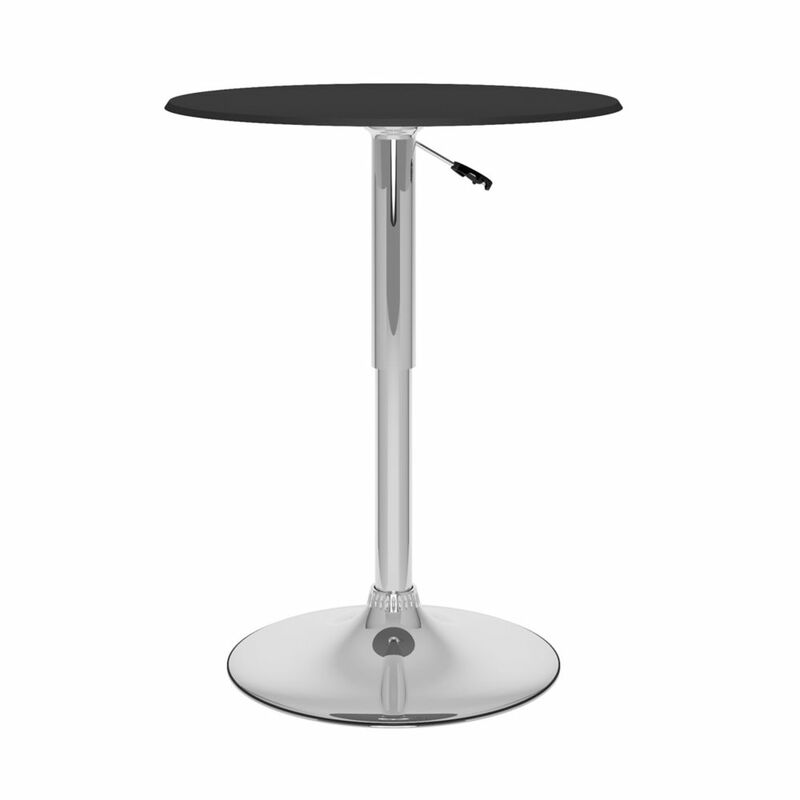 T-402-VPD Adjustable Bar Table in Black Leatherette is rated 3.0 out of 5 by 1. Rated 3 out of 5 by Marko68 from Good quality It’s a good quality item, although it too some work to put it together and if lifted or moved much, it could fall apart. I have it in one spot, so it’s fine. The top swivels, and there’s no way to stop it from moving, so be aware that the top will move if pushed.